Special “Retailer Trying to Figure How Many to Order of Each Cover” Variant Cover Month! 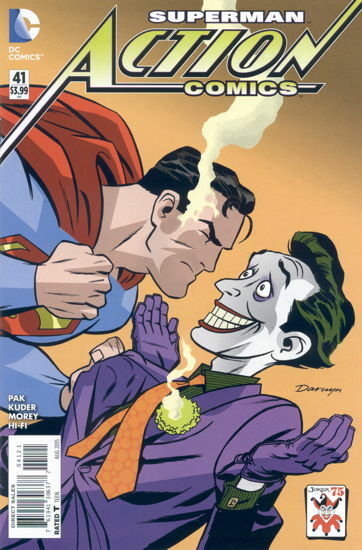 And here comes another month of people seeing the variant covers and thinking one thing and requiring me to explain “no, no, it’s just a variant…the cover image doesn’t reflect the contents.” So, sorry, kids, no Superman versus Joker, no Joker wearing Green Lantern’s ring, no Joker pierced with Green Arrow’s arrows, etc. etc. Also, despite the actual story in this comic taking place after the events in Superman #41, despite Superman #41 being referenced in a footnote in this story, you didn’t miss Superman #41 since it’s not coming out ’til the 24th of this month. Just for your information. …The comic does do a very good job of making you curious about just what did…er, will happen in Superman #41, however. It’s a weird mix of the story being very outside the typical Superman formula, but feeling like it builds on the Superman we know, rather than the “let’s do Superman, but different!” throwing-at-the-wall-to-see-what-sticks that characterized most of Superman’s New 52 existence. 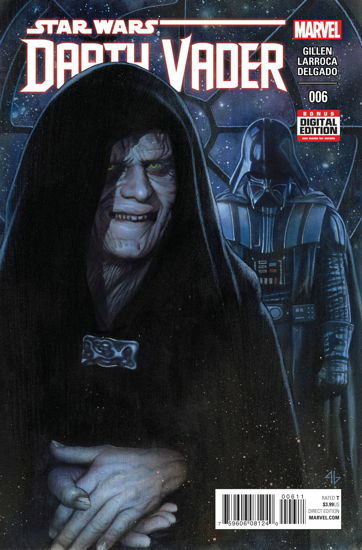 We’re getting three Star Wars comics this week…the regular series, Darth Vader , and Princess Leia . That’s a bit much, almost Avengers -esque in its scheduling, but I do have an awful lot of customers who are interested in just the Star Wars books, so getting all three at once won’t be that much of a burden. I don’t know if I’ve said it on my site already, but the timing and success of the Star Wars books vis-a-vis the opening of my own shop was very fortuitous: the release of the new titles driving new customers into shops, causing them to seek out and find my store, was a strong financial influx just when my young store needed it. In fact, at one point I had double-reordered the first Darth Vader by accident, to which I reacted with “I’m never going to sell all of these.” Of course, they sold out and now I wish I’d triple-reordered them. I don’t have a dog in the Secret Wars race, and while I appreciate the strong sales on this series and most of its tie-ins, but I don’t have any particular interest in it (but I’m still getting this). Which is fine…nobody can be a fan of everything, and I’m certainly not against it by any means. Between this and Convergence , though, that did leave me trying to figure out order numbers on a bunch of oddball titles at about the same time I’m still trying to suss out the buying habits of my new customer base, and believe you me, my friends, that took all of my comic book retailer super-powers to tackle that particular task. But I’m mostly managing, with a couple of hiccups (who knew people would want that Ultimate End comic, after years of Ultimate comics just not selling). But anyway, I did buy that Future Imperfect tie-in, because it’s Peter David revisiting that old mini-series of his that I enjoyed so much. 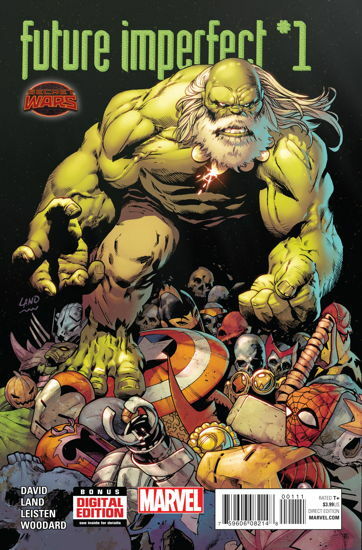 I guess the Maestro (the evil future Hulk, for those of you who don’t know) has also popped up in David’s recent Spider-Man 2099 run, so I guess I’ll have to look into those, too. When is DC just going to give Mr. Cooke his own Art book? Mike, I imagine that your specific brain anatomy is quite unique. Somewhere between the parietal lobe, anterior commissure, and third ventricle lies an extremely well-developed variant-cover-ordering-thalamus. Your melon will likely be preserved in formaldehyde and studied for years to come. Here’s something I’ve long wondered: Why are so many variant covers so much more awesome than the regular covers for that issue? If the company really wants to sell more comics, shouldn’t they make the variant cover into the actual cover, and make the boring one the variant? So how did Convergence and it’s various tie-in sell, now that it’s all over? How do you think it will compare with Secret Wars? I’m pretty sure those would be better stories than what was actually published! The RETAIL FORCE was with you!